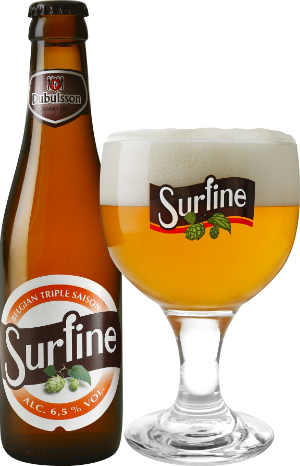 With the Surfine, we are reviving a brand which originates from the rich history of Brasserie Dubuisson. The beer is a traditional Saison and a typical regional product from the Province of Hainaut. It is brewed with 3 kinds of malt, 3 varieties of quality Belgian hops and fermented with 3 types of yeast. The Surfine is a golden blonde beer with 6.5% alcohol by volume. This refreshing beer has a surprisingly balanced, slightly bitter taste. The aromas are strikingly complex and fruity aromas; citrus is the predominant note but there are flowery touches, reinforced by impressions of herbs and pepper. At the first tasting, a drily bitter character comes to the fore, but it’s never overwhelming. The aftertaste, with its slightly sour undercurrent, gives the beer a refreshing character and makes it easy to digest. Storage advice: store upright at a temperature of 4°C (if stored lying down, wait 15 minutes before uncorking).